“No one has written the book of life,” he reminds me as we breach conversation, sitting across from each other at a booth in the café car. The morning is new, pink still lingering on the tips of clouds as we ride North and then East along Lake Erie. He’s an army vet, retired to travel the world, share philosophy, and slow his pace of life. “So many people are unhappy,” he remarks, reflecting on his travels. “Do you ask them why?” I return. 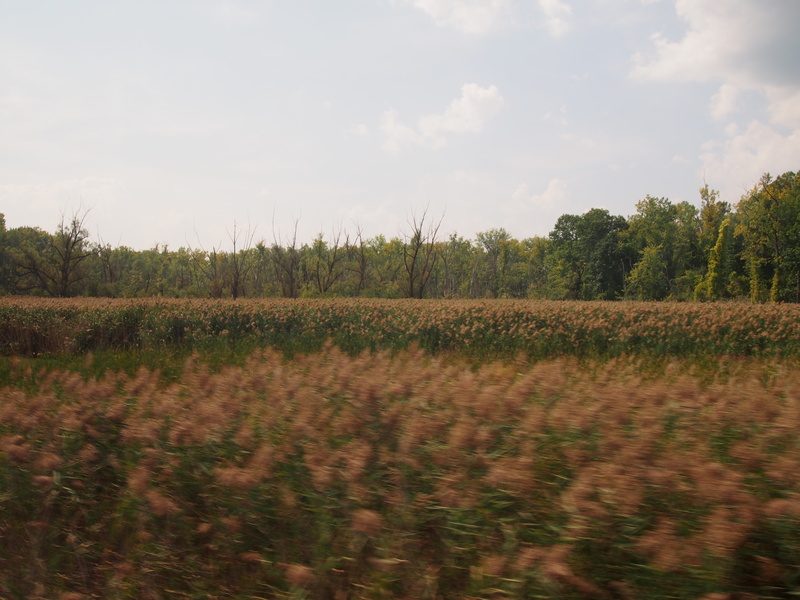 Train travel strips away some of this fear, I think to myself as the Ohio and Pennsylvania countryside slides by in a blur. I wonder why I happen to be having this particular conversation on this particular journey; travelers typically sit alone, reading our books or staring out of the window. But also, just by virtue of this solitude, we invite conversation. So now, I sit exchanging stories with a stranger, asking him questions. I learn that he’s a traveler, a wanderer, a wonderer, a Buddhist, a pacifist, a questioner, and a mechanic who strives to live a simple life. “Why don’t you make eye contact when you talk?” he asks. Good point, I think, and then spend the rest of the time trying to look him in the eye. It’s hard. But we continue to ask questions, trying to stay present, volleying curiosity back and forth like ping pong balls. I don’t know if he has earned my trust, this stranger, but I am curious nonetheless. Why do you read fantasy? Why do you want to go to Belize? How do you like to teach? What do you want to learn next? Where have you traveled? Why do you think people like to tell each other stories? What brings you to this train? Where are you going next? Why did you hike the Appalachian Trail? Are you happy? The sound of rails has always been comforting to me. Maybe it is all my years of traveling between Seattle and Portland on the Cascades, years of auditory memory. Maybe it’s the platform’s telltale hiss and sigh, exhaling for a new arrival. Maybe it’s the engine clanging like a dinner bell as it slowly rolls into the station, rich with anticipation. These sounds are old, borne on the wind from days of steam-powered trains and iron horses belching black coal out onto wide plains and hard lands broken for agriculture. There is the sound of wind, screaming between cars, as old as the whispering of iron couplings between cars as they slide over each other, well oiled. 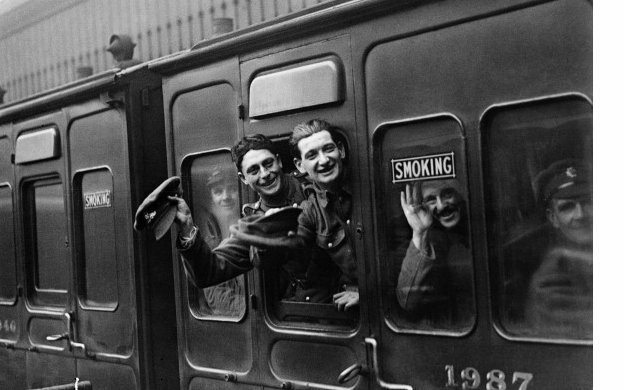 There is the sound of young soldiers bidding farewell, catching handkerchiefs and waving to dear lovers, almost falling out of open windows as their engine inches forward. These sounds, these memories, are part of the history of rails and wheels and engines and cabooses, bound forever together across a great country. This morning, I stripped the sheets and pillowcases off my futon bed in Rochester after a delightful weekend of friends and fruit pies and fresh-feeling lakes and frosty beers. I bid farewell to fine friends with fierce hugs and fleeting hand waves. Until we meet again. And then I step on the Empire Service, Train 284. It is early morning and the light is pale, sending a grey cast across the telltale blue seats. My fellow passengers are still sleeping with their mouths open, peaceful. They seek comfort across seats made for two, not one in slumber. I step on to greet my new family of sorts, a group-think already in creation. The conductor takes up a whole bench. He can hardly walk down the aisle without touching each seat with his width. Small towns pass us by in rapid succession- Fairport, Palmyra, Lyons, Clyde, Savannah, Weedsport, Jordan, Solvay, Kirkville, Canastota. Now, in the café car, he sits in his seat, staring quietly, calculating figures in his book. He knows all too well the surreality of this strange family. Each day we come together, a new band of strangers, each journey new, each station stop a rebirth. Where are we now? He schemes with his assistant, voices low and head bowed, sending garbled messages across wireless transmitters, messages clouded by abbreviated train-speak. Numbers. Estimated times. A lady from Delaware runs the snack bar, always moving as she works. She’ll go home on Amtrak when she arrives at Penn Station. She doesn’t dare venture into the maze of the city, she says. I wonder, what does she call home when she’s not home? In Albany, people scurry up and down the platform, weighed down by luggage and travel anxiety. They emerge from the fog and silence, filling an empty station like clockwork. Our new conductor stands in his jaunty cap, starched white shirt, clip board and welcoming smile, waiting to greet new friends. Passengers sprawl out on seats, making themselves at home, leaving indentations in the seats from hours of sitting and tapping their feet. These are hours of endless entertainment, highway-free travel I call it. 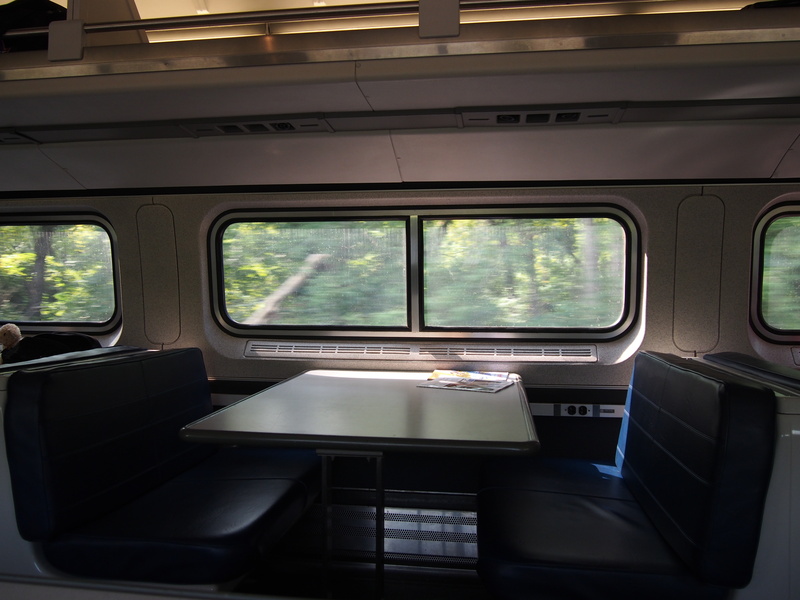 Rail lines cut pathways through small towns and National Forests and state parks, along waterways so close to the edge of beauty that you swear you could open the window and fall right in. 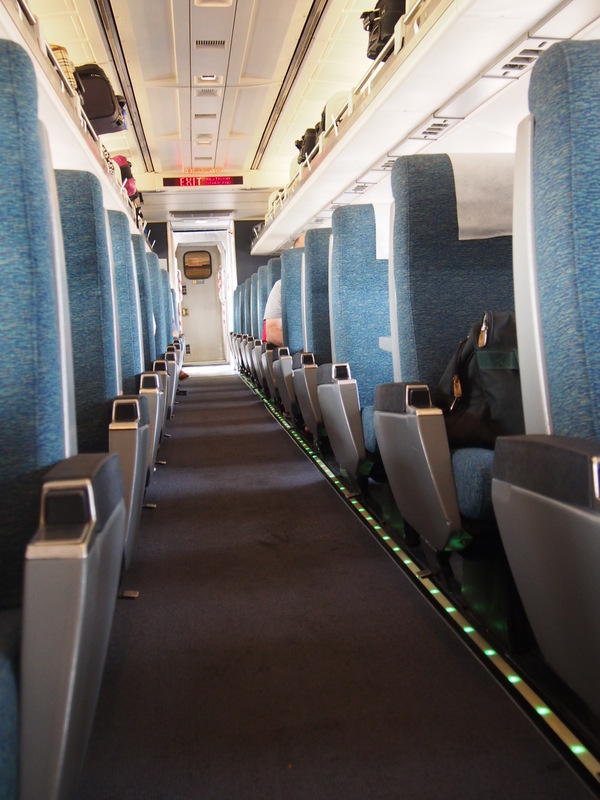 The rails seem sturdy until they’re not and the seats are comfortable and roomy until you try to sleep through the night. But the windows are wide, the people are never short of stories, and you can buy craft beer from the café car for $14 a bottle. What does it mean to be patient, to notice the details of the world, instead of checking our phones for proof that we exist? It’s as if we’re waiting for something to happen, watching trees watching us as we barrel by across invisible state boundaries- Ohio, Pennsylvania, New York, Massachusetts. There is no announcement, only swaths of land unspoiled. Foliage threatens to bloom red, to burst into flame with cooling evenings. Their blush is golden, spreading to every leaf like blood migrating northwards in embarrassment. The trees themselves can hardly believe it’s almost fall. Travelers take this time as quiet time. To sleep, to read, to talk, to meet people, or to just stare out the window. Time for nothing, time for everything, time to awaken to reality, time to brush quietly with strangers. 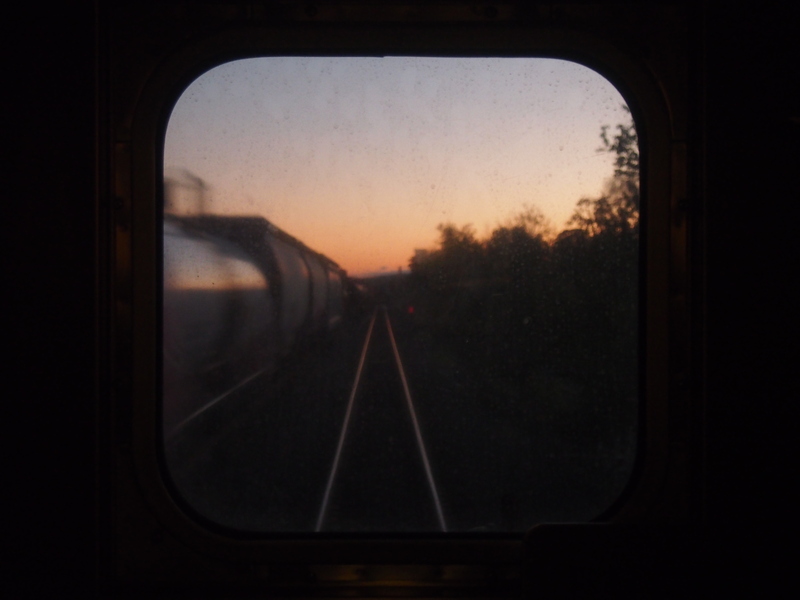 Tags: fall, history, humans, morning, questions, train, transition, travel. Bookmark the permalink.